Nearly Found by Elle Cosimano. Sequel to Nearly Gone. Review: Being an engaging young adult 12 and up recommended book, Nearly Found by Elle Cosimano grabs your attention with its suspenseful mysteries that you won't stop reading until they are solved. Nearly Found by Elle Cosimano has appropriate and easily read vocabulary for the recommended audience. In Nearly Found by Elle Cosimano, Nearly Boswell starts to work as an intern at a forensics science or crime lab. On her first day, she finds out she's working on a girl from her neighborhood, Adrienne, who she has been helping to find with a good friend. Soon after that, she and her friends receive notes found mysteriously in their houses. They believe that their old classmate who has been just released from jail, is sending them. The body of a missing person then turns up, but with a message for Nearly scratched into the bones. Who could this corpse be? You will find Nearly Found by Elle Cosimano as an engaging and suspenseful mystery you can't stop reading! I found Nearly Found by Elle Cosimano a great mystery that I read for hours each day trying to solve. I loved the plot twists and suspenseful events that caught me by surprise. The characters are also well developed, but you might want to read the first book in the series to better understand the primary characters. Nearly Found by Elle Cosimano was the best book I have read since Nearly Gone, the first book in the series! We would like to thank Penguin Young Readers Group for providing a copy of Nearly Found for this review. 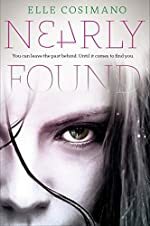 Have you read Nearly Found? How would you rate it?